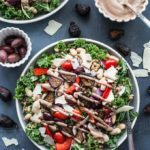 Fig tahini dressing? I could drink that with a straw! This sounds awesome, Leanne! I adore farro so I’ll be trying this one for sure! Thanks Kelsie! The dressing is thick and creamy, so perfect for dipping too! Just sayin’! ;) Hope you get a chance to try it! Have a great week! Thanks Dawn! The sweet fig dressing really does pair nicely with the other savoury ingredients. And farro is incredibly filling. Definitely adding it to salads more often! Hope you have a great week too! Any recipe with the word Tuscan in it gets my full attention – and this is no exception!! So hearty and delicious! And the deep earthy colors just make me happy!! Pinned! Thanks so much Annie! You know me, I had to add a pop of colour to help brighten up the dreary January weather! Thanks for pinning! How cute are those little figs? YUM! I could eat my weight in figs…and I love Bob’s Red Mill so much! I’ll have to give their farro a try. Thanks for an awesome recipe, Leanne – I can always use more salads in my meal prep line up! Thanks Haylie! 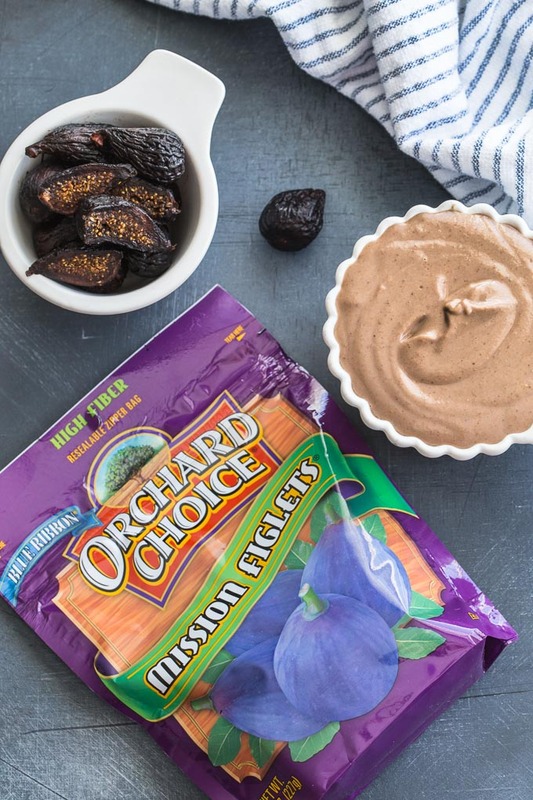 Funny story, the first time I tried Orchard Choice Mission Figs was at the Everything Food Conference last year. And I’m certain on the flight back home I really did eat my weight in figs! So good! 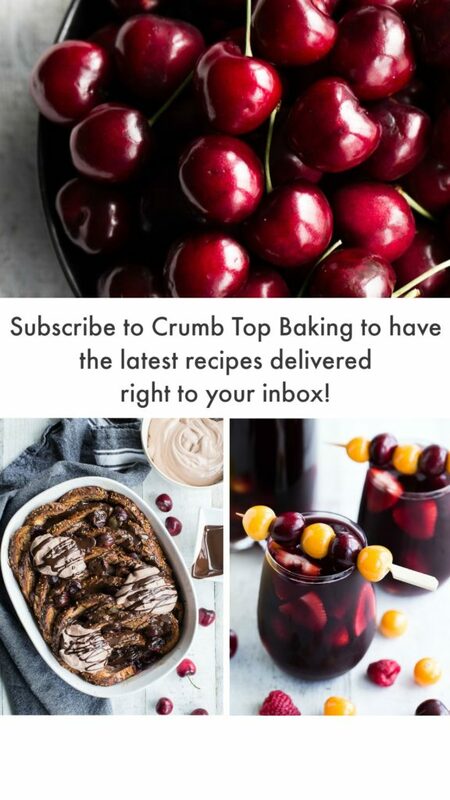 Glad you like the recipe. Happy Monday! Thanks Terry! Figs add a nice taste and texture to many different recipes, especially salads! Definitely worth a try! I’m a huge fan of figs and farro, so count me in! 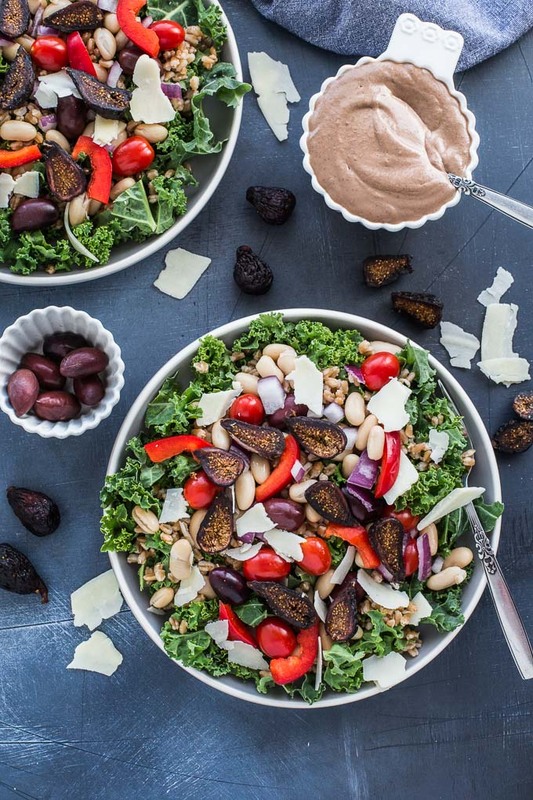 That fig tahini dressing is just a brilliant idea — all of these flavors sound so great together. Beautiful job Leanne! Thanks so much Marcie! The fig tahini dressing has been a staple in our house since early January. I’ve been adding it to this salad, and every other salad too! Happy Monday! I am so so in love with this salad! So many different textures and flavors—exactly how a bomb salad should be. This is a perfect lunch OR dinner! Thank you so much Dana! There are definitely a lot of different tastes and textures going on here. Glad you like it! Hearing about your SMART goals takes me back to work when I had to write out yearly goals for improvement! I think I much prefer writing out goals when it comes to food 😉 This salad looks SO hearty and filling, Leanne! Haha! Sorry for the work flashback Katherine! I’ve had to do those at work too. I’d much rather food related goals as well! What a wonderful hearty salad…it’s a meal all on itself! 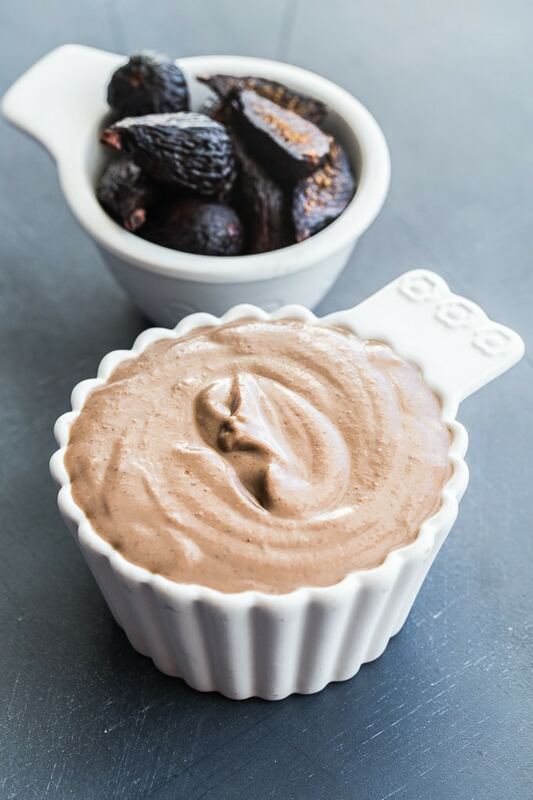 I’m totally loving that luscious fig tahini dressing. It all looks delicious Leanne! Thanks Marisa! With the hearty beans, farro and kale, this really is a filling salad. 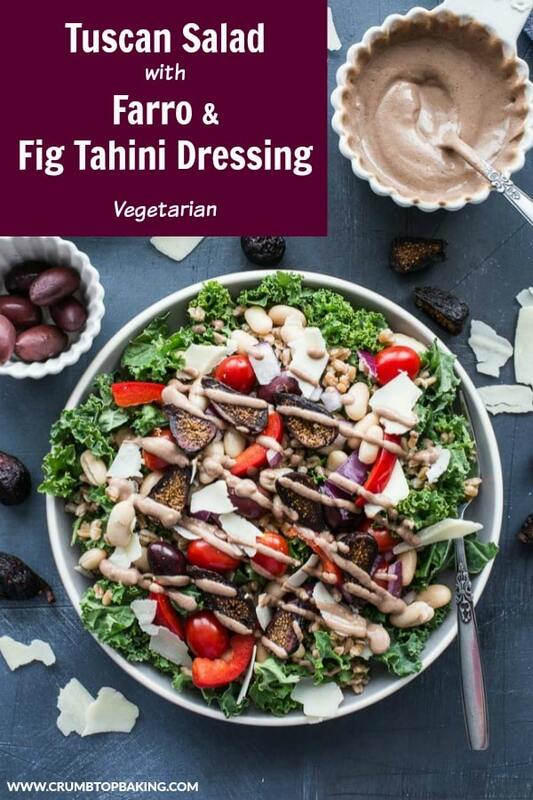 And the fig tahini dressing is going on everything lately! I actually have some of those same dried figs in my fridge lol!! They are amazing!! And that dressing sounds incredible!!! What a stunning salad! Thank you Camila! Those figs are addictive. One of my favourite snacks lately, when I’m not adding them to salad! You should definitely try farro in salad. It’s hearty and filling, and the chewy texture adds a nice contrast to the other ingredients! Thanks Philip! Love -and eat often- each and every one of these beautiful ingredients. Together, they are like a symphony. Thank you so much Nicoletta! That’s so lovely of you to say! Hope you’re having a great week! I’m aboslutely loving the ingredients in this salad Leanne! 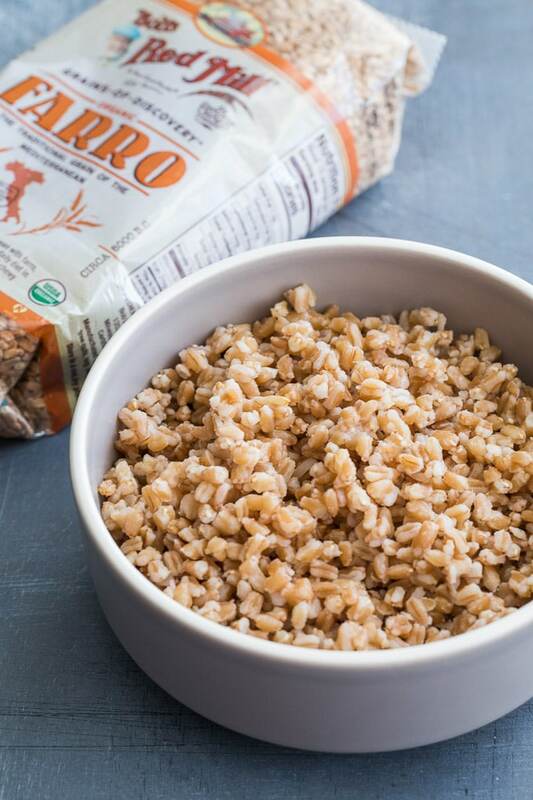 Farro is one of my favorites, as is Bob’s Red Mill! Love that fig tahini dressing too. Need to add this recipe to my salad rotation! Yay! Thanks Mary Ann! Hope you get to try this one! Love farro too! It adds such a heartiness to this salad! You’ve sure got some great flavours going on in this salad! The moment I read “fig” I knew I had to have it. This hearty and healthy meal looks delicious! Thanks Vanessa! 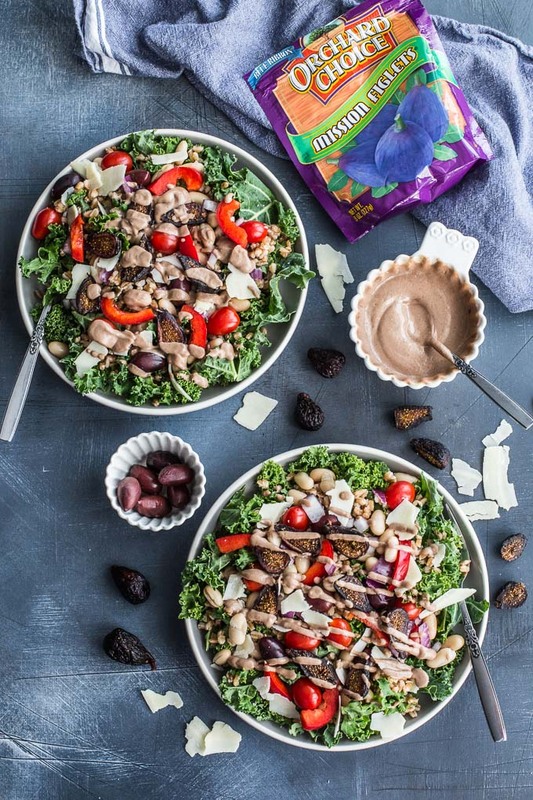 Yes, there is definitely a lot going on in this salad! I hope you get a chance to make it. 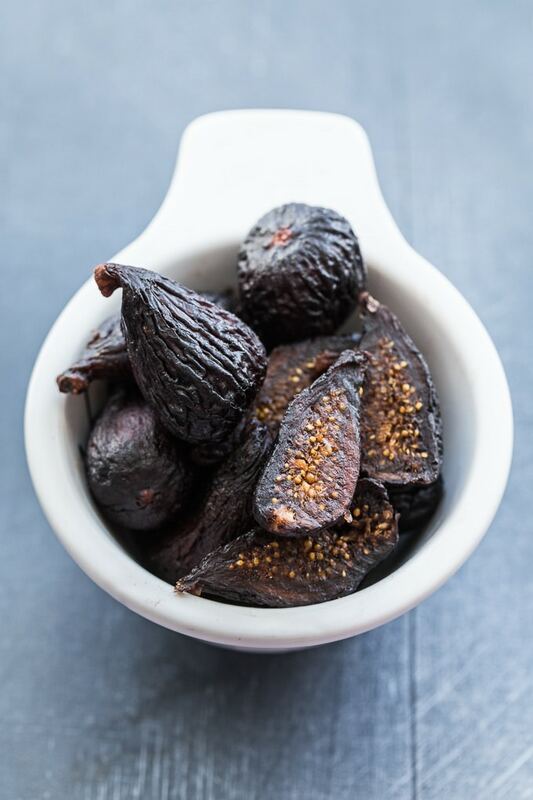 The dried figs add such a great taste and texture! you had me at figs and olives! i love fruit in my salad, and an underseasoned salad is a sad one, so this sounds great. Thanks Heather! I’m with you! I love a well-seasoned salad! And figs and olives are a great combo! What a hearty, delicious salad! 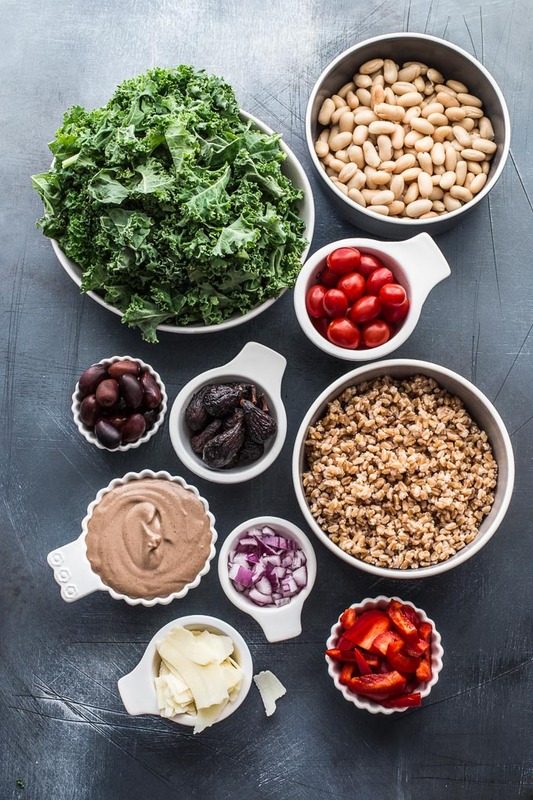 I love the texture and nutty flavor that farro adds to salads and Fig Tahini Dressing? Sign me up!! Thanks Marissa! I love farro in my salad for the very same reason. And the dressing is a nice one for sure! 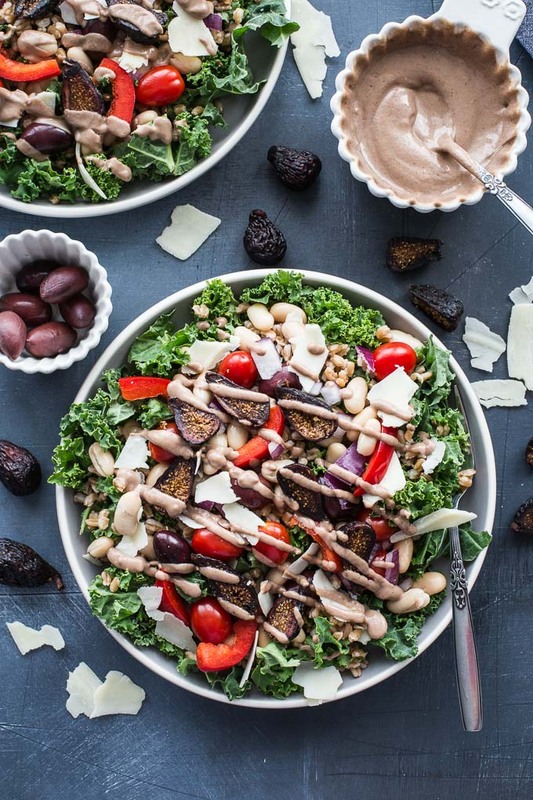 This salad has me totally fixated especially with the sound of that fig tahini dressing! So creative Leanne! Thank you Christie! The dressing is thick and creamy, and I’ve been adding it to all my salads lately! This looks incredible and so unique. Oh and love your meal prepping tips! Thanks Terri! Those tips work for me, so I’m glad you liked them!